Please Note: that all the above photographs have been taken with a wide angle panorama lens and some walls or angles may look curved or elongated. 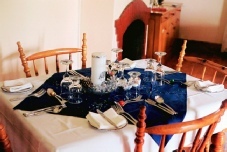 The image does make the room look a bit larger that it is, but it clearly shows all the elements in one or two photographs. 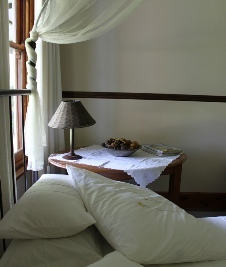 The five double en-suite bedrooms are tastefully decorated in cream and white, and fitted with comfortable furnishings for a memorable and restful stay. One of these rooms has its own fireplace and is often specially requested during the bracingly crisp winter months. 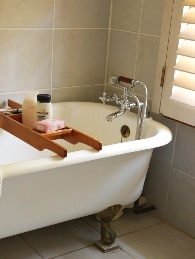 The en-suite bathroom which accompanies this particular bedroom features a bath which has been restored, having originally come from the Imperial Hotel in Pietermaritzburg, and which at one time was used by the Prince of Wales during his visit there. 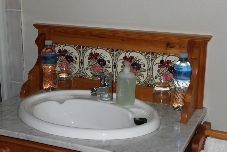 Most of the bathrooms feature Andrew Walford wash basins.